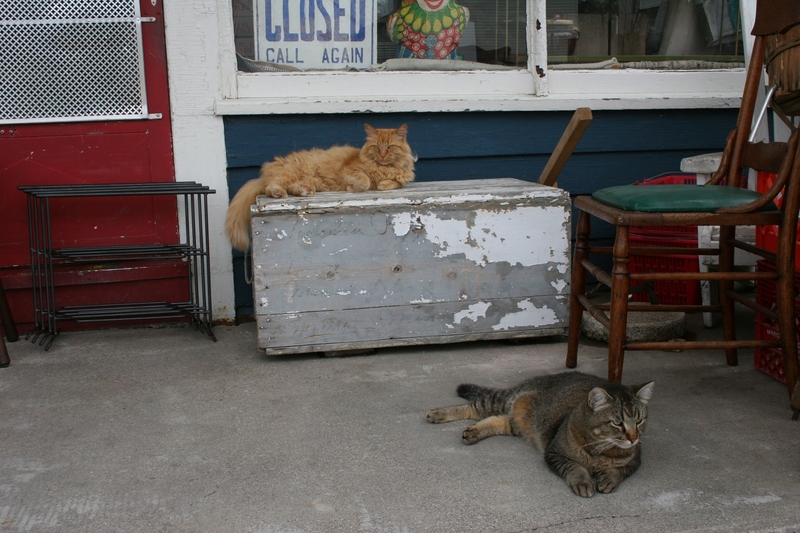 The Hope Feline Patrol lounges on the porch of Hopefull Treasures. 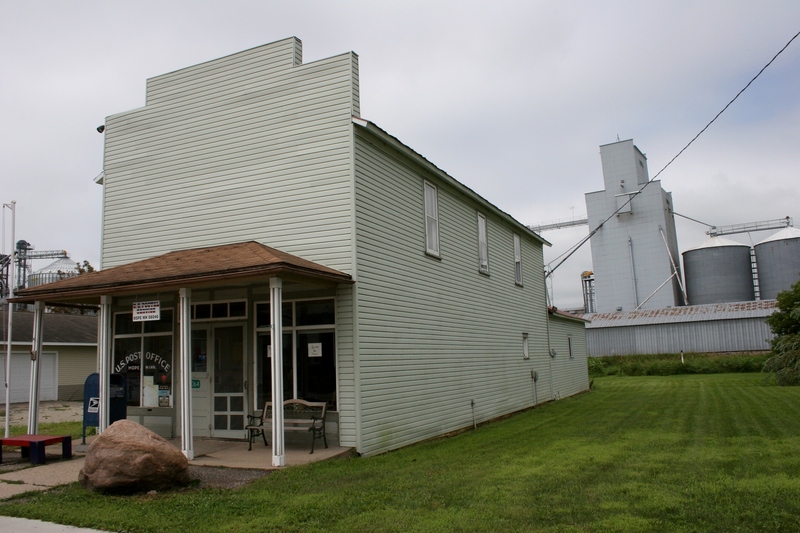 VISIT HOPE, MINNESOTA, late on a Sunday morning and you might feel like you’re in a ghost town. Except for the cats. The Hope Feline Patrol, I’ve dubbed them. When my husband and I pulled into this Steele County town because that’s what we sometimes do on Sundays after church—hop in the car and drive to places we haven’t been to before—not a soul was in sight save those two cats. 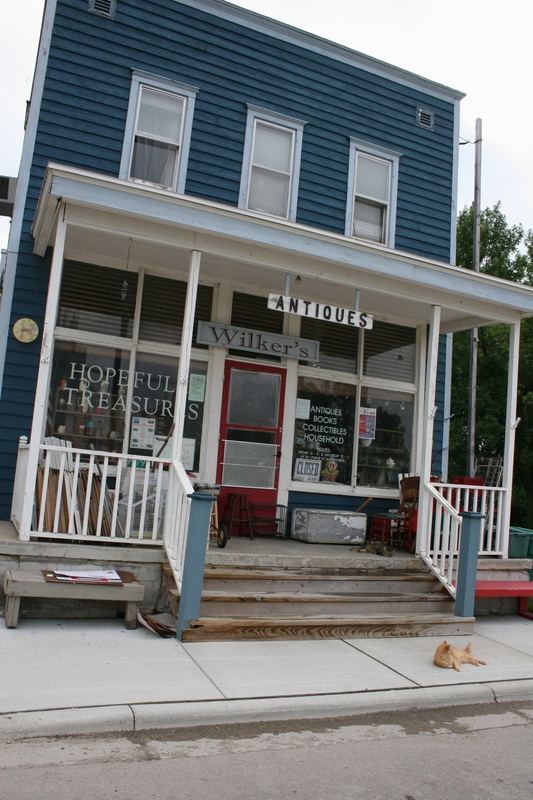 They lounged on the porch of Hopefull Treasures, aka Wilker’s Antiques, all stretched out as if they had not a care in the world. Until I appeared. The long-haired orange cat stirred, on alert, jumped off a weathered wooden box and wound around my leg. 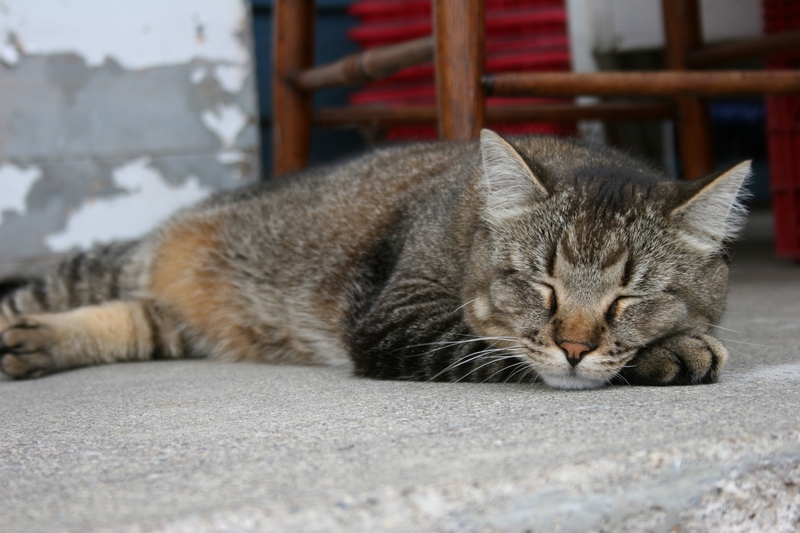 The tabby stayed put, flicking eyes toward me, then, satisfied that I presented no threat, resumed cat napping. 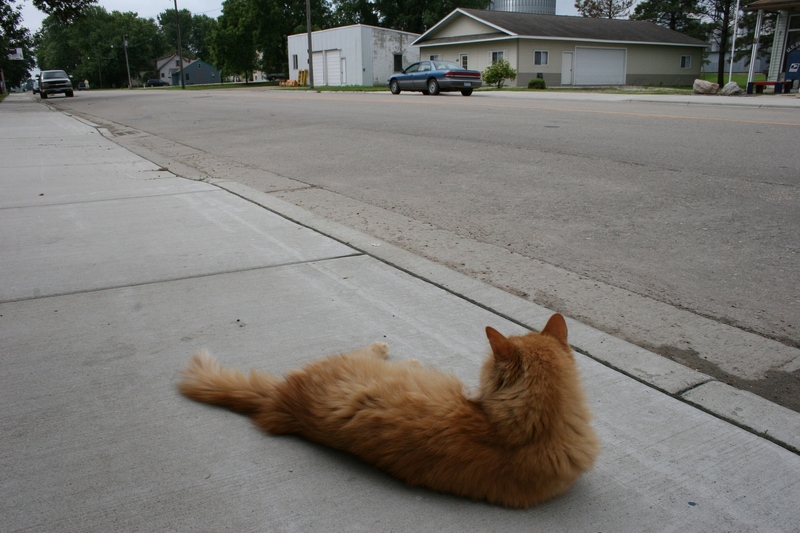 The orange cat, however, plopped down on the sidewalk in front of the antique store, rolled around for awhile and then assumed a leisurely pose with a watchful eye on the single main route through this town of 120 residents. The orange cat almost immediately sat up and assessed the situation when I arrived. The napping tabby left patrol duties primarily to the orange cat. Hopefull Treasure's orange cat keeps an eye on the single road that runs through Hope. All the while I kept taking pictures of the cats and the antique store I wished was unlocked. It’s open only from noon to 6 p.m. on Fridays, from 10 a.m. to 3 p.m. Saturdays or by chance or appointment. Apparently I wasn’t drawing a chance card on this day. 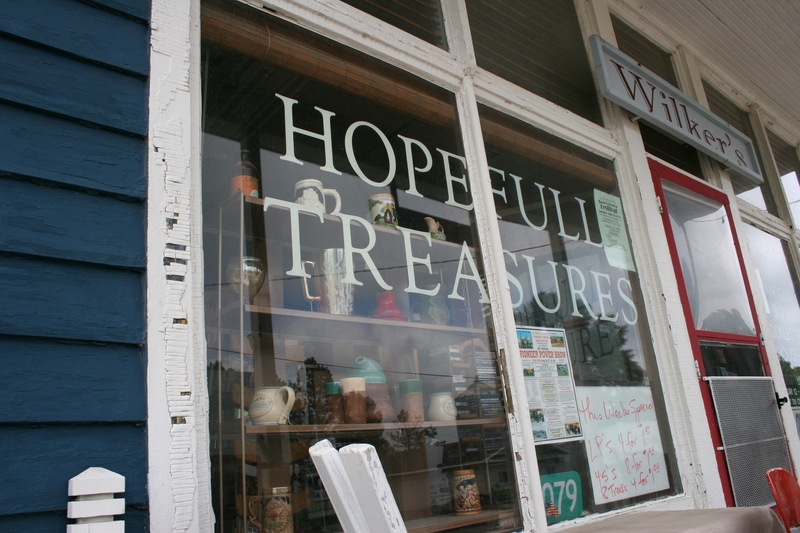 I knew I’d love poking around inside this place, scrounging for more story and photo treasures, plus antique and collectible treasures. Every place, every person, every animal, every thing holds a story. And at Hopefull Treasures I’d found my story in The Hope Feline Patrol. I had to peer into the windows of the closed antique store to check out the treasures. 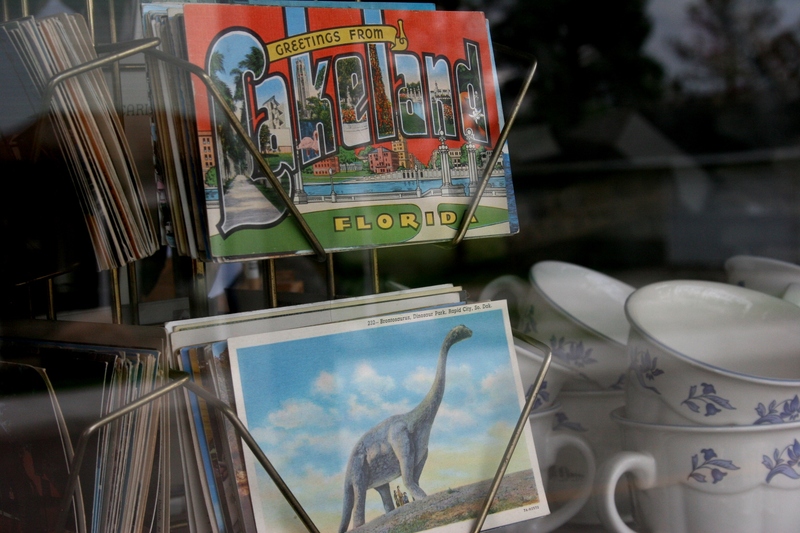 Vintage postcards and coffee cups I spotted through the front window of Hopefull Treasures. 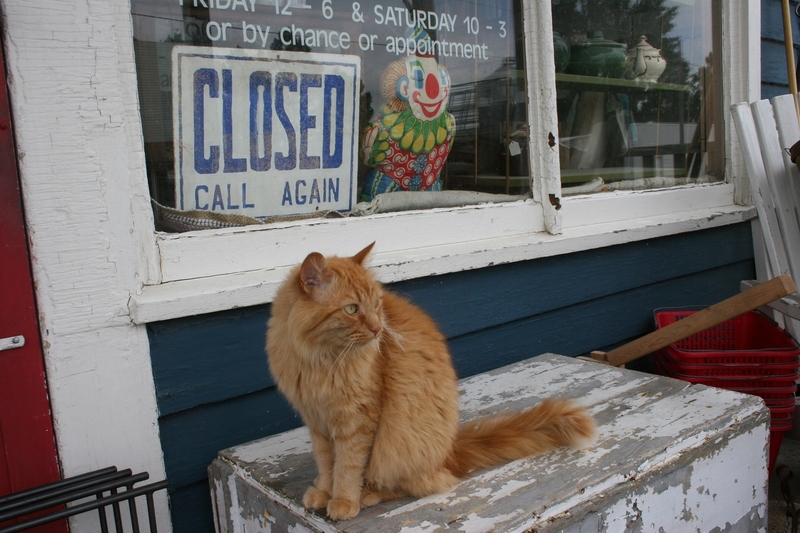 When I moved on down the street, the orange cat was still lying on the sidewalk in front of Hopefull Treasures. VENTURE INTO RURAL MINNESOTA—and we’re talking the small farming communities here, not what metro folks call “Greater Minnesota” or “outstate Minnesota”—and you’ll connect to our state’s agrarian roots in some interesting ways. 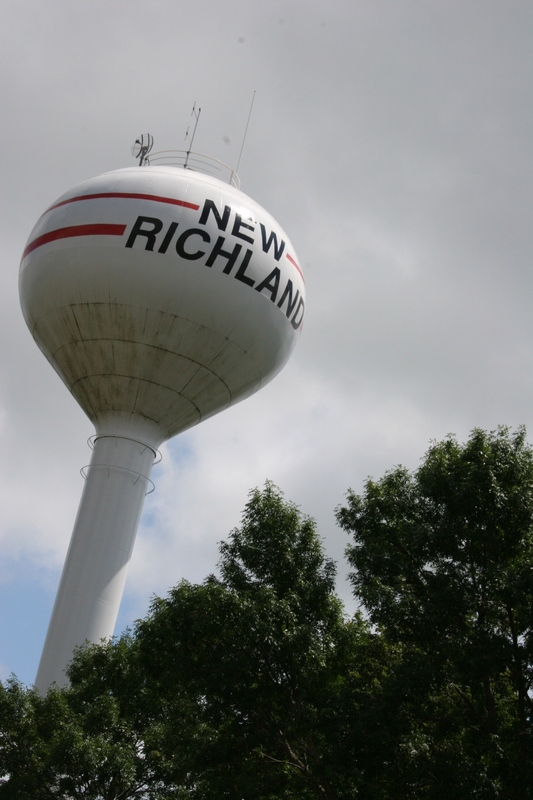 Take New Richland, for example, a town of 1,200 in southeastern Waseca County. 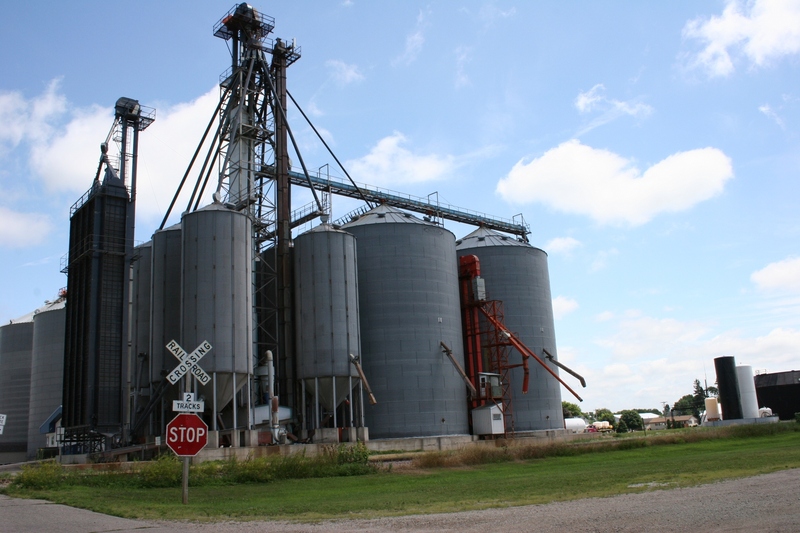 Drive into town and you’ll see the usual grain bins and elevator and other farm-related businesses you would expect in an agricultural community. A cluster of grain bins in the heart of New Richland. A corner of the New Richland Post Office. Note the grain bins a few blocks away. Around the post office corner you'll find this mural which reflects the connection between city and country. A snippet of the country portion of the mural. 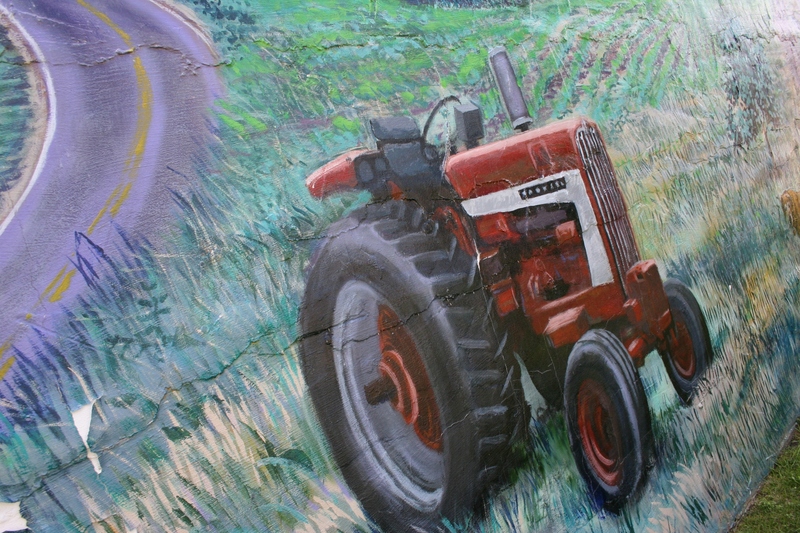 I wonder how the artist decided what type of tractor to feature? Country connects to city in this detailed mural. 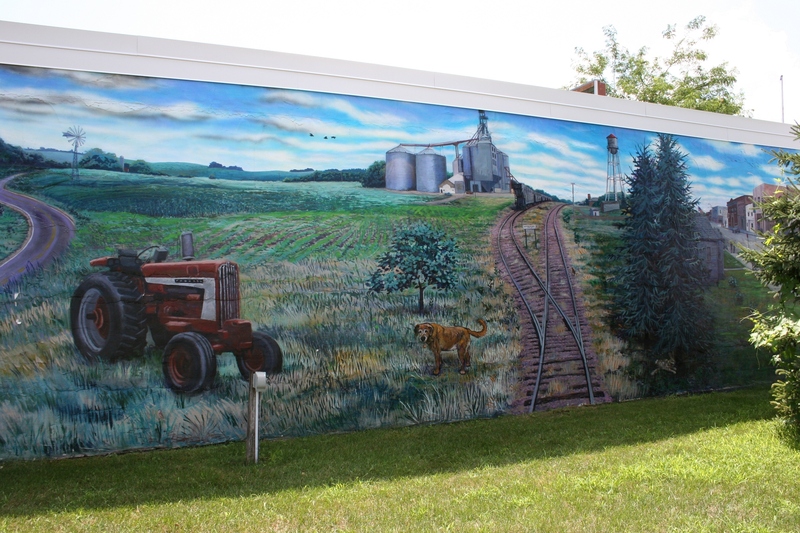 and you’ll find a mural depicting farm and city. Now I’ve seen many a mural in my day, and I’d rate this as among the best. I wish I knew who to credit for this detailed artwork that draws the eye along the winding country road, down the train tracks to the grain elevator or along city streets to downtown. But I couldn’t find any information about the mural in a quick online search. However, I did learn more about New Richland and the pride this community takes in its agricultural roots. Just a few weeks ago the town celebrated its 28th annual Farm & City Days. Events included the usual parade, street dance, bingo, antique car show, medallion hunt and such. But I found a few activities that definitely say country through and through. Teams of two competed in the second annual Chore Boy Race. (Just for the record, girls can participate, too; the winners were Molly Flor and Brandon Mullenbach). Anyway, it’s a contest that involves eggs, milk, hay, grain and wheelbarrows. You can learn more about the competition by clicking here and reading this story in the local newspaper, The Star Eagle. If you’d rather use your brain than your brawn, Farm & City Days offers a “Guess the weight of the pig” contest at $1 a guess. The person with the closest guess wins the pig and processing at Morgan’s Meat Market. This year two entrants correctly guessed the exact weight of 208 pounds and agreed to split the hog, according to the Farm & City Days Facebook page. If you didn’t win the pig, you could still eat pork by buying a pork sandwich meal from the Waseca County Pork Producers at the city park. Two other agricultural-themed activities included a kids’ tractor pull and a Farm vs. City 3-person Scramble at a golf course. I’m disappointed I missed Farm & City Days because it sounds like one heckuva good time, as small-town celebrations typically are. But I wouldn’t even have known about this annual farm-city event if I hadn’t been poking around New Richland last Sunday, spotted that mural on the side of the post office and then gone online to learn more about it, which I didn’t, but I did. 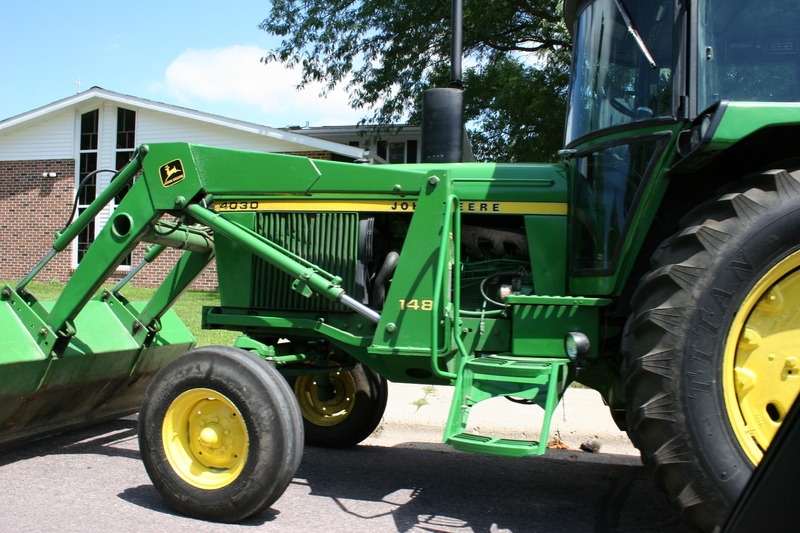 This John Deere tractor was parked outside the funeral home in New Richland on Sunday afternoon. My husband and I stopped in New Richland while on a recent Sunday afternoon drive. Check out my July 24 blog post from this community and watch for future stories and photos from New Richland. The Hope Post Office, which I photographed on Sunday. 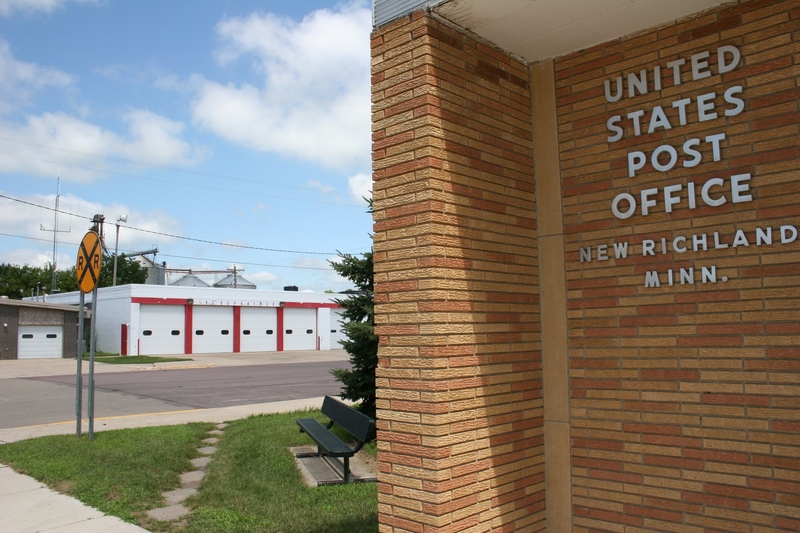 I WISH I DIDN’T have to update a story I posted just yesterday about the post office in Hope, south of Owatonna off Interstate 35. But I must, and the news isn’t good. On Tuesday the United States Postal Service released the latest in a lengthy list—try 3,600-plus—post offices that could be closed to save money. Hope wasn’t on that list. But apparently it was on an earlier list as I discovered just minutes ago. While researching another topic online, I came across two newspaper articles about the proposed closing of Hope’s post office. Community residents have already gathered at a meeting to express their dismay with the planned closure. Click here to read a story published in The Owatonna People’s Press. Click here to read another story published in the The Star Eagle based in Waseca County. Residents of Hope and the surrounding area, according to the articles, will have to wait about three more months before a decision is made on the proposed closure. You’ll read in these stories how residents fear losing the one central place that connects them, how they worry about the impact on local businesses and more. Their concerns are legitimate. I said it in my previous post and I’ll say it again. 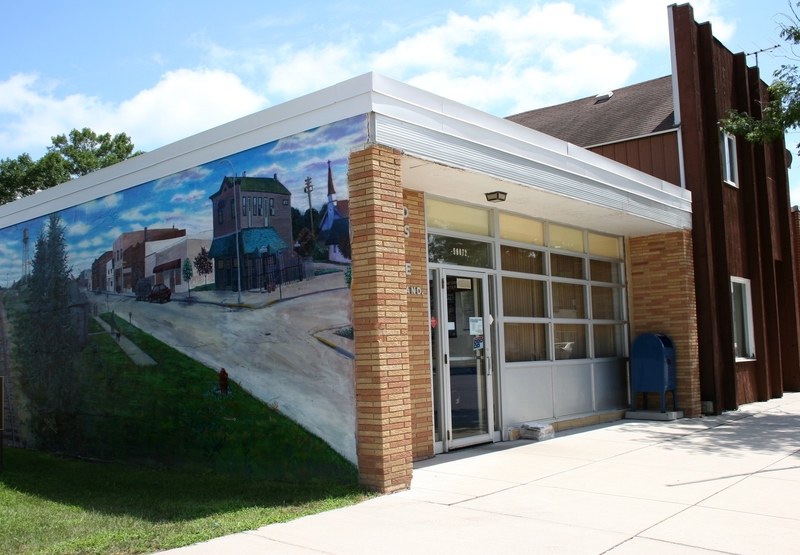 In a small town, a post office serves as a community gathering spot. It isn’t just a place to pick up mail, buy stamps or send a package. 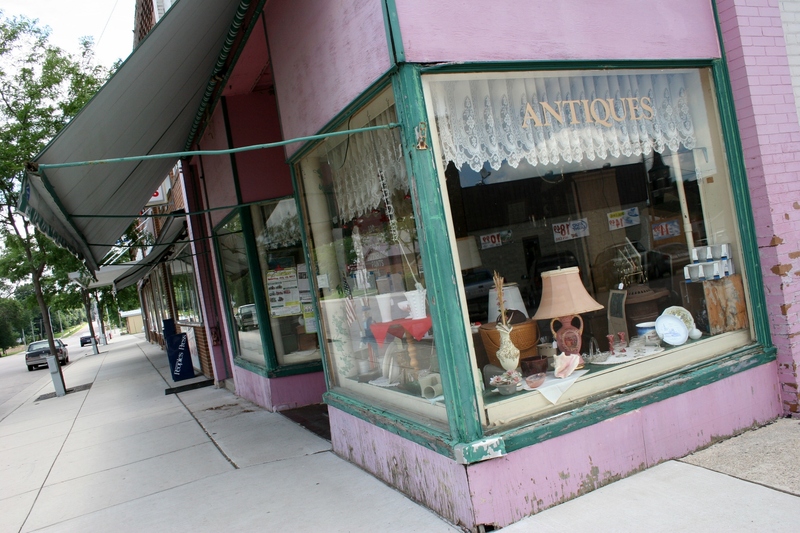 It is part of the heartbeat of small town Main Street. 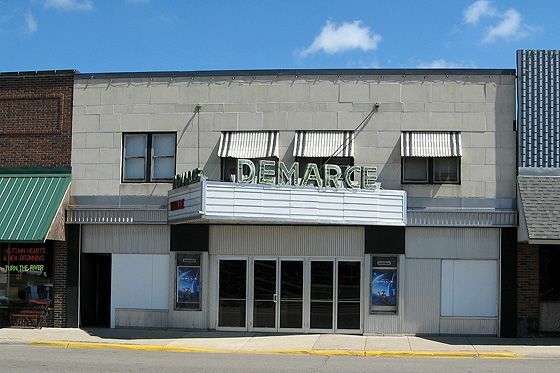 The DeMarce Theater, a long-time business in downtown Benson in western Minnesota. NEARLY SIX MONTHS after Tim and Susie Kletscher purchased the historic DeMarce Theatre in downtown Benson, they are hosting the screening of a Midwest thriller that just could hit the big-time. Munger Road, written and directed by Nicholas Smith, debuts to the public at a 7 p.m. showing on Thursday, July 28, with a second show at 9 p.m. and repeat shows on Friday evening. 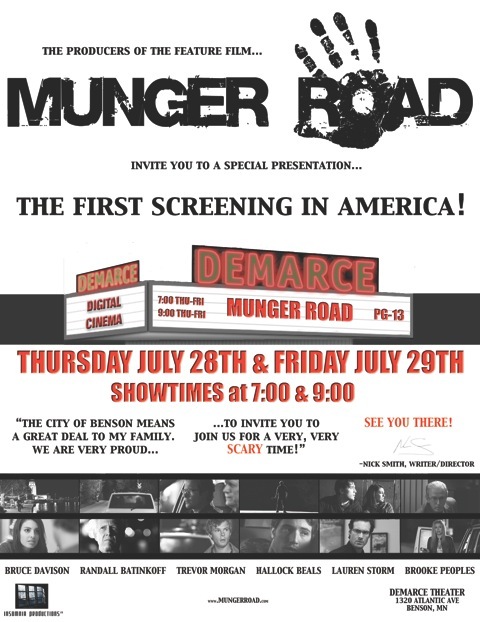 A promotional poster for Munger Road's screening in Benson. 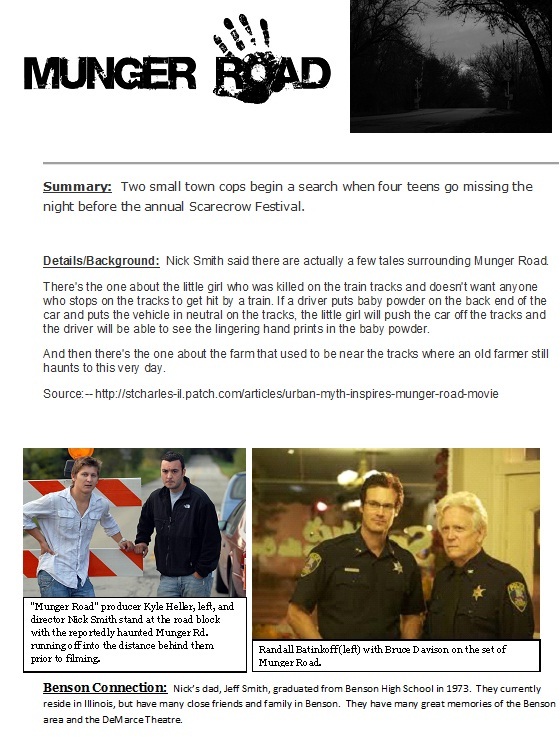 The PG-13 movie, shot in and around Smith’s native St. Charles, Illinois, is based on an urban legend about a supposedly haunted stretch of rural Munger Road. As versions of the story go, the ghost of a little girl killed on train tracks along the road still haunts the site as does a farmer who lived on a farm near the tracks. The movie version focuses on four teens that go missing along Munger Road the night before the annual Scarecrow Festival. St. Charles really does have an annual Scarecrow Festival—this year October 7 – 9—during which Munger Road will premiere. Actor Bruce Davison, with popular film credits like Six Degrees of Separation and X-Men, stars in the movie. Another poster promoting the Illinois-based thriller. projection and surround sound systems and a silver screen. The couple got their lucky break because Munger Road executive producer Jeff Smith, Nick Smith’s dad, grew up in Benson and graduated from Benson High School in 1973. The Smiths have many close friends and family in Benson and a nearby family lake cabin where they are currently vacationing. That promotional groundwork has also included airing the movie trailer before every Harry Potter and the Deathly Hallows: Part 2 showing at the DeMarce Theatre and doing interviews with area media. Kletscher is hoping for big crowds to fill the 320-seat theatre. He’ll have Munger logo, “I survived the Drive” t-shirts, designed by Nick Smith, for movie-goers to purchase. Before the film starts, Nick Smith will address the audience and ask them to later evaluate the movie on comment cards. “They really want to hear what average people say about it,” says Kletscher, who has been in nearly daily phone contact with the Smiths and recently met them. FOR MORE INFORMATION about Tim and Susie Kletscher’s purchase of the DeMarce Theatre in February, click here to read an earlier blog post. Also, go to the DeMarce Theatre Facebook page by clicking here. For the record, Tim Kletscher is my cousin and an elementary school teacher in Benson. THE NEXT TIME YOU’RE traveling Interstate 35 south of Owatonna, instead of whipping by the Hope exit at 70 mph, pull off the freeway and check out this unincorporated community of 120 residents, probably best-known outside of Steele County for Hope Creamery butter. Unless my husband and I missed the signage, we never saw a sign marking the creamery and simply guessed that the butter-making operation is housed in an old brick creamery on the edge of town next to a farm. You would be wrong, oh, so wrong. First point of interest: 56046. That would be the Hope Post Office. With a street front facade resembling the general stores of yesteryear or perhaps a building from a western movie set, this old-style structure charms. 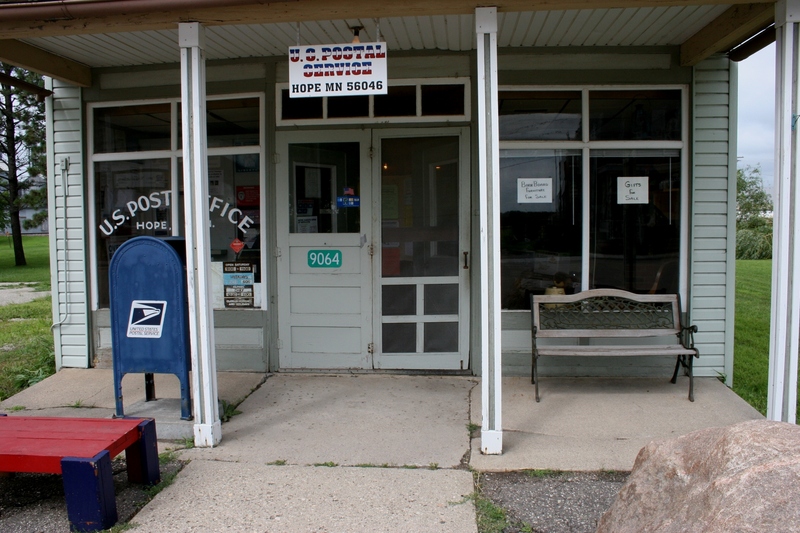 The Hope Post Office sits along Main Street. The elevator complex in the background is just across the train tracks. Even the lettering on the front window has old-style charm. Maybe it doesn’t take much to impress me, but I appreciate buildings with character. I quickly determined that the post office serves as Hope’s community hub. I pulled open the screen door and stepped inside a closet of an entry, the door to the post office to my left, the door to a gift shop to my right. Smack in front of me, I found business cards and signs, church festival notices and other information tacked onto a bulletin board. 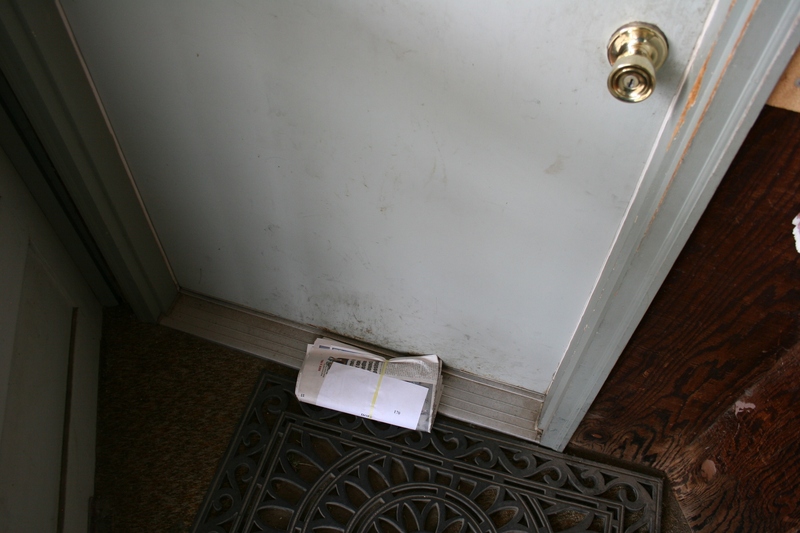 A clutch of rubber-banded newspapers lay on the floor in front of the post office door. 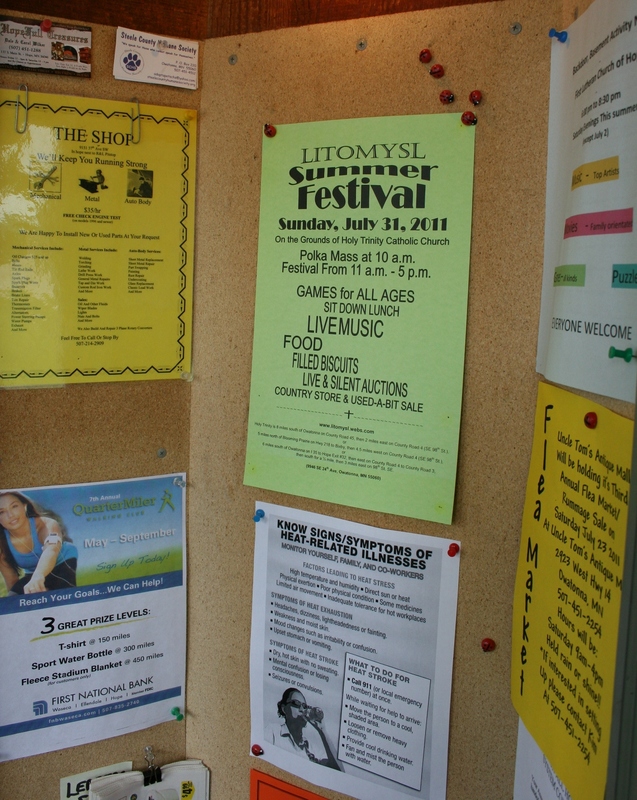 The community bulletin board inside the post office entry. A clutch of bundled newspapers outside the locked interior post office door. 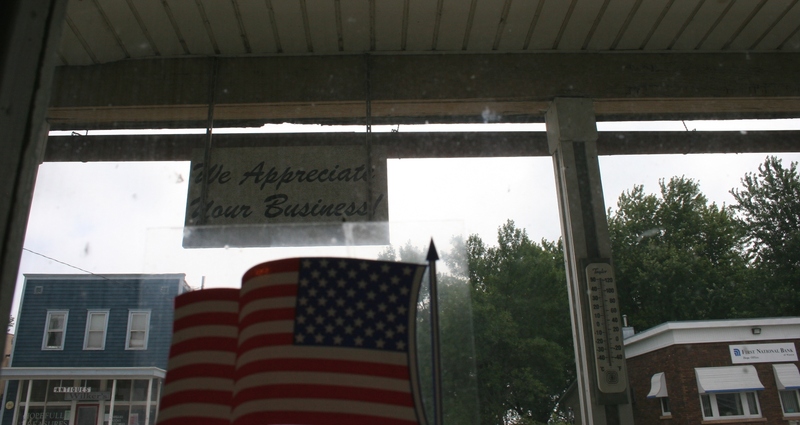 From inside the post office entry, a view across the street of the bank and an antique store. Since I was there on a Sunday afternoon, I had to settle for standing outside, peering through the large, cracked and taped front windows to view the customer service area that is smaller than most bathrooms. But it serves the purpose and I’m sure Hope folks are happy to still have their post office. I always figure once a community loses its school, its post office and its bank, well then, you may as well close up the town. So far, Hope has only lost its school. Today the U.S. Postal Service releases a list of 3,600-plus post offices under consideration for possible closure in a cost-cutting effort. I hope Hope is not among them. 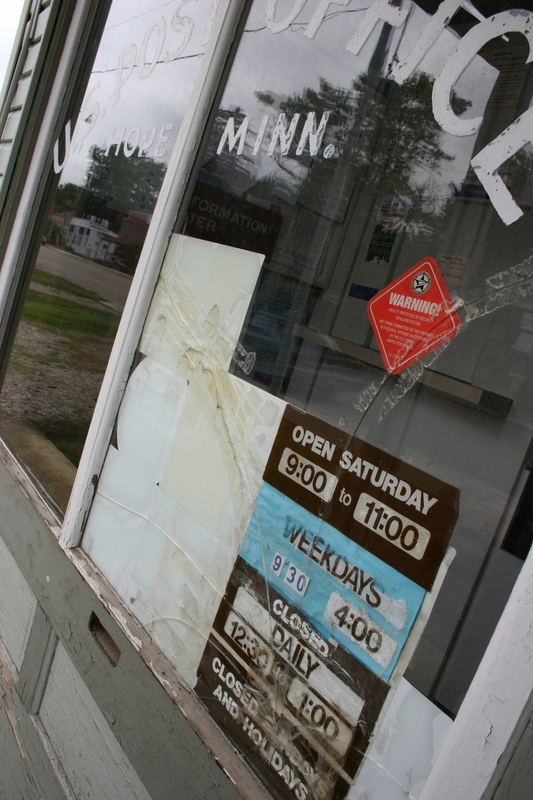 Post office hours are listed on a cracked and taped front window. CHECK BACK FOR MORE posts out of Hope and other area communities I recently visited while on a Sunday afternoon drive. It’s my philosophy that most of us are missing out on the treasures of small-town U.S.A. because we fail to get off the freeways, park our vehicles on Main Street and explore. Either that or we’re “too busy” to slow down and notice the details worth noticing in our small towns. 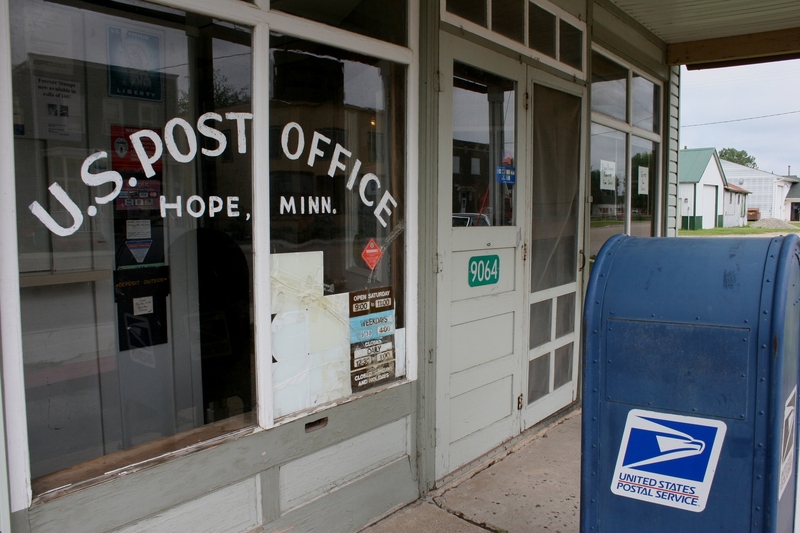 If anyone knows about the history of the Hope Post Office, submit a comment. I would like to learn more about this building. 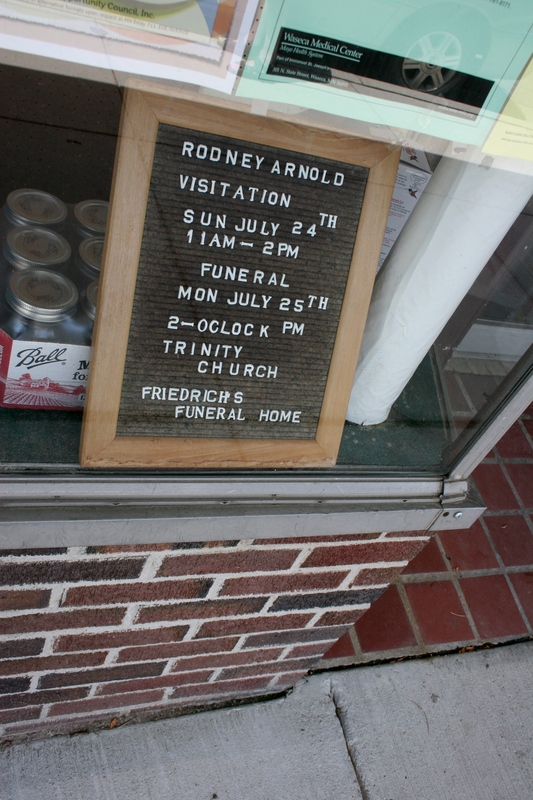 A sign in the Gambles' hardware store window gives updated visitation and funeral information to the residents of the New Richland area. SHE PULLED UP ALONGSIDE the curb Sunday afternoon, leaned toward the semi-open window on the passenger side of her van and asked if my husband or I knew why Rodney had died. “He seemed so young,” she said. She didn’t exactly have a response for me—not one I can publicly share anyway—so I took this as one of those small-town oddities. Even finding a Gambles hardware store in New Richland, population around 1,200, seemed an oddity. 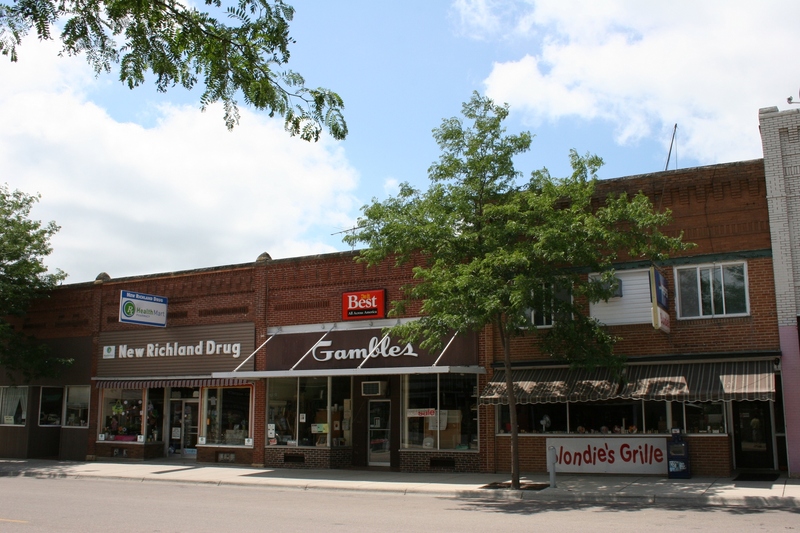 But there it was, sandwiched between New Richland Drug and Blondie’s Grill, along a main drag in this Waseca County community. These hardware stores were common when Randy and I were growing up in the 1960s, but not so much now. 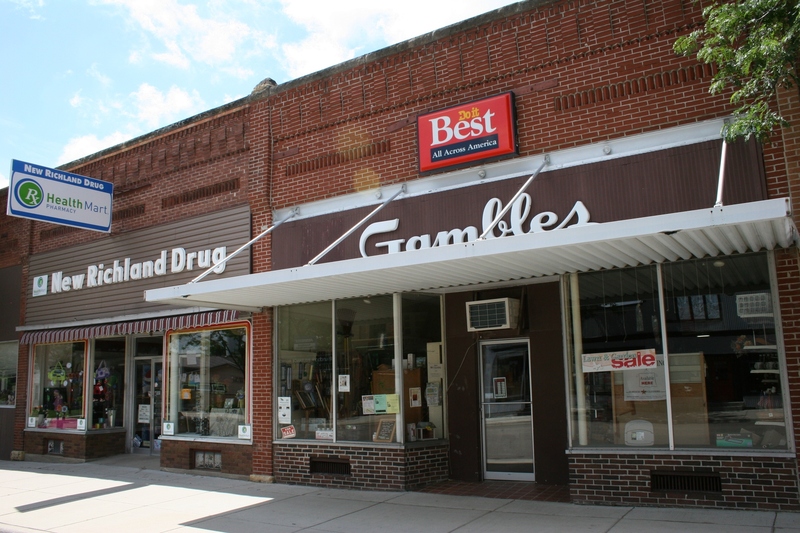 Gambles stores, like this one in New Richland, were once common in Minnesota small towns. From 1925 - 1928, Gamble-Skogmo was headquartered in Fergus Falls and then moved to Minneapolis. As surprised and delighted as we were to find the Gambles store, we were even more surprised to see that funeral and visitation information posted in the front window next to the canning jars. But apparently this business place public posting is a usual practice in New Richland since the elderly van driver pulled up in front of Gambles for the sole purpose of checking out the information about Rodney Arnold. Randy, wanting to know how she defined “seemed so young,” inquired while I snapped photos of that seemingly out-of-place sign in the hardware store window. “He was maybe in his early 60s,” the woman, probably in her late 70s or early 80s, guessed, then drove off. For the record, Rodney Arnold was 62. Upon our return home, I went online to Friedrichs Funeral Home and checked. I also learned that this self-employed dry wall installer met his friends every morning for coffee at Dads Good Stuff, just a few doors down from Gambles. The things you learn if you simply take the time to stop along a small-town Minnesota Main Street…to read the latest funeral information. 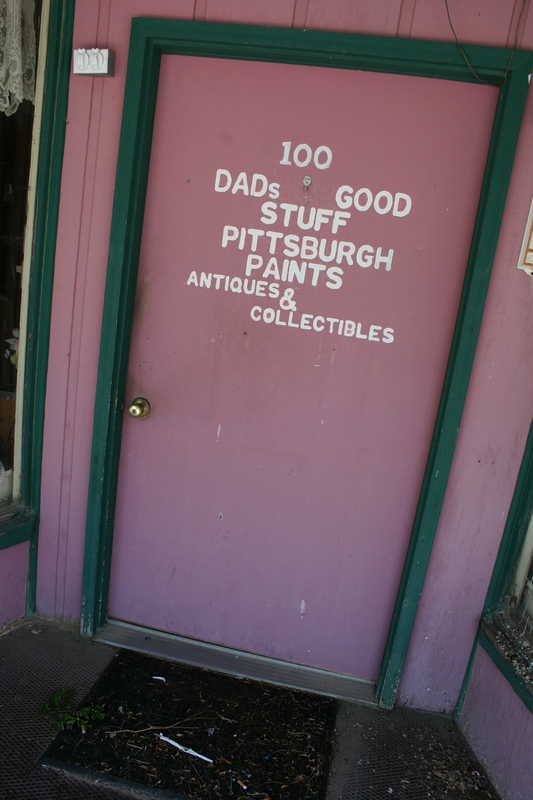 The flashy front door of Dads Good Stuff. Unfortunately, Dads Good Stuff antique, etc., store was closed when we were in New Richland Sunday afternoon. Just a close-up shot of New Richland's Gambles store, which was closed when we were in town. READERS: This is the first of many posts I’ll publish this week about a Sunday afternoon drive south to Hope, west to Ellendale and New Richland, north to Otisco and Waseca, and then back home to Faribault, with two country church stops in between. WHEN MY 25-YEAR-OLD DAUGHTER mentioned the U2 concert to me about a week ago, I thought she said “YouTube” and asked for clarification. That didn’t help. I had no idea, none, nada, what musical group she was referencing. Never-the-less, she went on to tell me that four friends were going to the concert and she wished she was among them. Then today I received an email from her, followed by more emails, in which she attempted to educate me about the hottest musical ticket in town since, well, I don’t know who. I considered summarizing our online exchanges, but then decided they are just way too entertaining as written to edit anything except the frivolous fluff. I am, however, adding italicized, parenthesized editorial comments. DAUGHTER: I’m going to the U2 concert!!!!!!!!!!!!!!!!!!!!!!!!!!!!!!!!!!!!!!!!!!!!!!!!! I’m really excited, you have heard of U2, right, Mom? ME: Ummmmmmmmmmmmmmmmmmmmmm, I had not heard of U2 until you mentioned the group last week. Even Dad knows the group. What songs do they sing? So happy for you! I heard last night on the news that they are making plans for dealing with the crowd in case of bad weather, which is a possibility. Also sounded like there would be a mess of traffic. Better you to go than me. 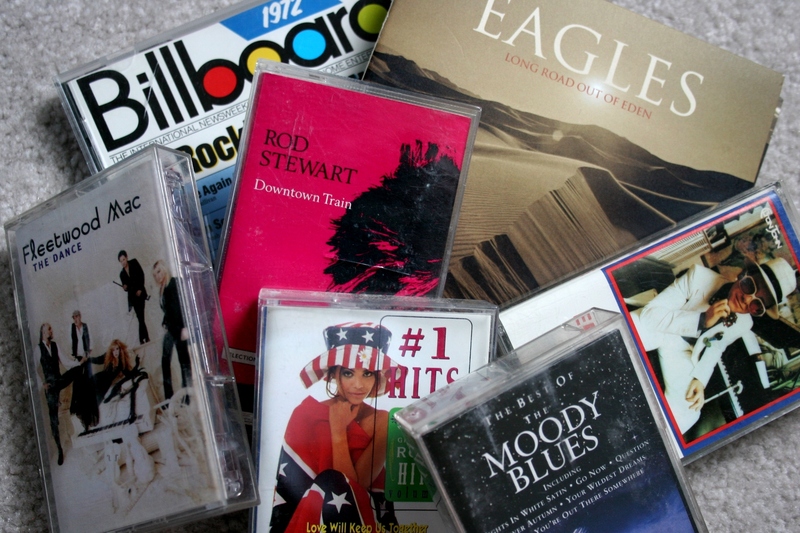 Just a sampling of the 1970s era music I own on cassettes and CDs. Most of my collection from that time is on record albums, which I did not feel like digging out of storage. DAUGHTER: Mom. I’m sure you’ve heard “Beautiful Day” and a bunch of their other songs. They are the biggest band to come to the Twin Cities in 30 years. Maybe you should do some googling to see if you have heard of them? How much are tickets? They must cost a LOT OF MONEY??? DAUGHTER: …this is a once in a lifetime opportunity…this could be the last time the band tours and I’ve heard the show is incredible. ME: Oh, OK, then, kind of like seeing the Beatles… Has U2 been around for a long time? DAUGHTER: Yes, since 1976…they are from Ireland… http://en.wikipedia.org/wiki/U2. They became popular internationally in the mid 1980s. ME: OK, I will check them out and educate myself. FYI: My daughter scored a U2 ticket because one of her ticket-holding friends had his wisdom teeth out today and doesn’t feel like driving up from Iowa for the Saturday U2 concert at TCF Bank Stadium.